Does your loved one have a French dream? We have the perfect gift to make it come true! 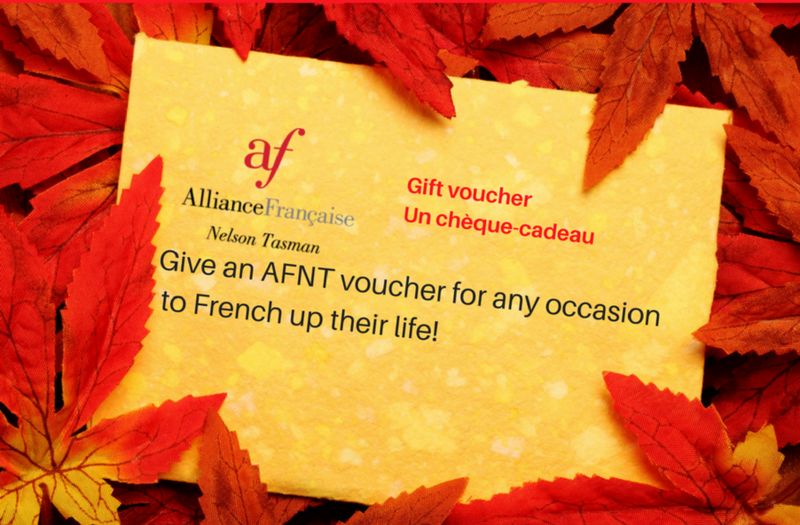 Choose the amount and offer them a piece of France with a gift voucher for a French course at the Alliance Française Nelson Tasman! Our gift vouchers can be used to go towards not only French courses (Adults and Children) but also for our Membership that will allow your loved one to access our French Library, the online platform Culturethèque, our cultural events and enjoy special discounts in some French events! This Voucher may only be applied to the enrolment costs of French language classes or a membership. It is not refundable or exchangeable, nor is it transferable or redeemable for cash. This Voucher does not guarantee admission into classes. Admission is subject to the availability of classes and requires the gift recipient to be present in person to enrol in a course. This Voucher is for single use only and must be surrendered to the Alliance Française Nelson Tasman when redeemed. This Voucher remains valid for 12 months after the date of issue. This Voucher is not refundable, not exchangeable or redeemable for cash. To order a gift voucher fill in the form, and we will send you the amount. Money to be paid into 02-0704-0380910-000 BNZ Alliance Francaise Nelson. Once the money is paid we will print your voucher. Please make sure when you pay that you have your name in the reference so Toni can match payments.